Annabelle Walsh thought she had it all. She was the star of her swim team, had a loving family, a great boyfriend, and to top it off, she’d be starting at UCLA in the fall. One day, she’d be referred to as Dr. Annabelle Walsh. She was living every girl’s dream – until her life was turned upside down. All starting with finding out that she's not just a human, but also a water spirit. Half-human, half-sprite to be exact. Although not just any sprite, Annabelle is prophesied to be the only one who can save both the sprites and mankind. With a mix of current events, anecdotes from Greek mythology, tidbits of folklore, and Leigh’s own imagination, we join Annabelle in her journey to restore order beneath the sea. Each step of the way her mind, body, and soul are pushed to the limit begging the question, how much can one half-human, half-sprite take? 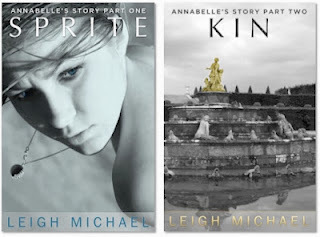 In anticipation of the release of Kin (Annabelle's Story Part Two) soon (very soon in August), Sprite (Annabelle's Story Part One) will be free on Amazon.com! In the post-apocalyptic world following a pandemic, dark angels arrive in Glory's small hometown to claim the eternal souls of her loved ones. Targeted by evil because of her heroism during the great plague, Glory fights back with the help of gutsy young witch Kaia, inexperienced guardian angel Sasha, and her intrepid demon-fighting dog Hallelujah. Complicating everything, a rift in time reunites Glory with an old flame and forces her to pay a huge price for love. The legend of Glory continues! The second book in the Legend of Glory trilogy! was nominated for the 2011 Best Popular Paperback for Young Adults List,　sponsored by the Young Adult Library Services Association (YALSA)　of the American Library Association. PRETTY SACRIFICES is available in both print and eBook formats. www.GloryLegend.com has links to most of the places where PRETTY SACRIFICES may be purchased: http://www.devinwrites.com/legendofglory.html And while there, check out photographs of all the characters from the novel and see a very cool book trailer video! Can you tell readers a bit about yourself? I write novels about uncommon heroes—ordinary people (and/or animals) who are called upon to do extraordinary things. I write in several genres: YA urban fantasy, paranormal thrillers, comic mysteries. Large mainstream publishers such as Simon & Schuster, and small, indie publishers have published my books. My novels have been translated into various languages and I have an international following. I’m a member of the Dog Writers Association of America, write a humor column for TAILS Magazine, and much of my writing supports animal rescue projects. When and why did you start writing? I wrote my first story at five years of age (a ghost story) and have been writing ever since. I was born to write. What's your favourite genre to read? I love reading all genres. What is the best thing a fan has ever said to you about your novel(s)? That it touched her soul. Are there any books that have made an impact on your life and what are they? I actually began reading at three years old and the first books I read were the LITTLE HOUSE ON THE PRAIRIE series by Laura Ingalls Wilder. That’s when I decided to become a writer. How much of your writing is realistic? I feel it’s all realistic. I believe in the subject matter I write about. And I do copious research down to the smallest details. If you could spend the day with one author or character from any books who would they be and why? Oh, Sir Terry Pratchett. I not only love his writing, but I am fascinated by his mind. I know he has been dealing with Alzheimer’s, but I bet he is still brilliant and provocative. Yes, definitely Sir Terry. Is there anything specific you'd like to say to readers? Enjoy my books. They’re written to be enjoyed on a variety of levels: pure entertainment, as philosophy, and as inspiration. Take from them what intrigues you. Allow your heart, mind, and soul to be touched. It’s why I do what I do! What do you think of Pretty Sacrifices? Do you like the interview? All information was provided via Reading Addiction Blog Tours. 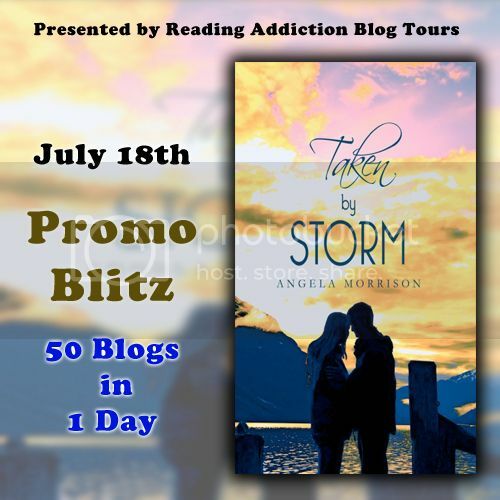 Angela Morrison is the award-winning YA author of　Taken by Storm　(Books 1-3)　and　Sing me to Sleep. She graduated from Brigham Young University and holds an MFA in Writing for Children and Young　Adults from Vermont College of Fine Arts. She grew up in Eastern Washington on the wheat farm where　Taken by Storm　is set. She's an advanced NAUI, Nitrox certified scuba diver. The hurricane that kills Michael's parents was inspired by a real-life diving accident. After　over a decade in Canada, Switzerland, and Singapore, Angela and her family are happily settled in Mesa, Arizona. She enjoys speaking　to writers and readers of all ages about her craft. She has four children--mostly grown up--and the most remarkable grandson in the universe. Mormon girl Leesie has life figured out until devastated Michael lands in her small town high　school. He needs her like no one has before. A rare journey into a faithful LDS teen's intimate struggle. Brand new paperback and reformatted ebook with fully scalable fonts. Includes bonus, never-before-published scene,　"Airport Good-bye!" Ten years ago this week,　Taken by Storm's　scuba-diving hero, Michael, swam out of Angela's brain and onto her page. Join the anniversary celebration! Win your own copy of the brand new paperback! Snag　Taken by Storm's　Kindleebook for only $ .99! Unbroken Connection　(Book 2)　and　Cayman Summer　(Book 3)　are free on Kindle! Hurry. 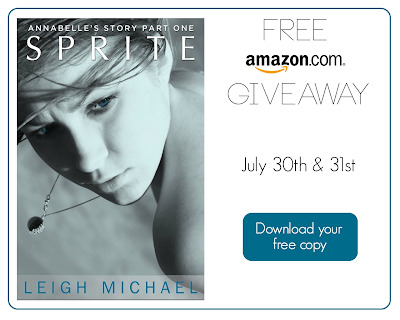 The promotion ends Friday, July 20th. Don't own a Kindle? Download free Kindle apps for your laptop, tablet, iTouch, or phone. I probably know what your thinking right wow what's this about? I would like to state first that the title is just to catch every ones attention! I cannot say it is not aimed at anyone in particular because..... that would be a lie. It is aimed at an author and I have let their publisher know and the author in question know I was planning on writing a post about a situation that occurred. This is something that has been eating away at me for numerous days and I think I need to write my opinion on the matter to see if my reasons are right or wrong. Recently I have been organising blog tours FOR FREE because I'm passionate about reading and I am so passionate about helping someone out but not just helping anyone out! AN AUTHOR! 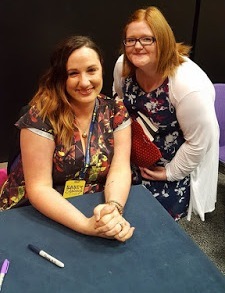 A real life AUTHOR who has published a novel and has wrote amazing characters for people like me to escape to another world and enjoy the best thing ever invented! BOOKS! :) Yes every author who contacts me I still go into complete shock and I get excited like a child on Christmas morning. To know that I could help them in someway organise something that even just lets one person know about there book is to me amazing. A year ago if someone told me I'd be a book blogger, organising blog tours, chatting to authors everyday, getting asked to review books, being contacted by publishers I would have gone into fits of giggles! I would have laughed hysterically and not stopped for hours because to me I wouldn't have had the confidence or any idea what to do. Your probably thinking.... whats the point in this post? Well recently I had started organising a blog tour for an author and I was struggling to find a blogger to participate on the last day of the tour. The author gave me strict instructions to make sure they had over 500 followers, to make sure the blogger gave them a glowing review, to also make sure they reviewed their novel in over 750 words and to make sure they received 5 stars! My first initial thought was oh S**T! Although then I started thinking I need to do this!! My life has been pretty hectic with personal issues, exams, revising and of course the never stopping book blogs! I know with the book blogs I signed up to organise this tour and it was my responsibility to organise it. So I did what any dedicated blogger would do.... I emailed over 50 blogs! I stayed up till 5:30am with college the next morning and an exam at 9:15 am! However, I never managed to find a spot for the blog tour! As the time was getting nearer and nearer I neglected my blog posts and I neglected my blogs! Due to personal reasons also! The first email I received from the author was..
*You stupid, idiotic little girl! I took the time out to help you organise my blog tour and all your doing is sitting staring at computer screen! I wrote the novel! That's the hard part all you need to do is email bloggers! * Obviously some has been edited as I will not use the language they used. I sent an email which said I am sorry I have really tried my best with this although it is very late notice for bloggers to review your novel, sorry. I'd like to say that I may have had this tour organised for days but I did not receive any of the materials until 4 days before the tour was meant to start! Is that enough time for reviewers? They did go further into detail although I replied to them letting them know I'd no longer wish to be contacted by them and I also emailed their publisher letting them know what happened and I also forwarded ALL emails that I received but also all emails which I had sent in reply. I would like to also tell everyone I got a huge apology from the publisher telling me they were disappointed in how one of their authors reacted and how very sorry they were that this happened. They understood right away that I would like to cancel any blog tours with them in the future as well. So..... I know this is one bad experience with an author, and I know it will NOT in anyway effect my judgement of any other publishers or authors. Also I would not like any rude comments or suggestions made against the author or publisher even though their names are not mentioned. I would just like to know from authors and bloggers do you think I could have done more? If I do not ask this question it will eat and eat away at me and I really do not want that. I am also sorry if this post offends anyone as I am not wanting to do that either. I have sent this post to the publisher to see if they would like to make any changes to it and they very nicely told me that they think it stated my opinion very clearly and they appreciate all I have done for them. I've recently been organising blog tours and am wanting to reach out to as many bloggers as possible who might like to participate. Interested? Well posts you can do include reviews, interviews, guest posts, book excerpts and even promo posts! If you have ANY questions at all just comment or email and I'll get back to you asap! A paralegal by day, she’s an author by night. Apart from being an award winning author for her short story "Cut", Reina has appeared in a blaze and made her mark on the literary world with her Ivanovich Series. The first is “In the Name of Revenge”, the second, “Deadly Decisions” and the third, "One Major Mistake" is to be released July 10, 2012. Having studied and obtained her Bachelor’s Degree in Literature/Creative Writing, she has found her unique style and is known for her works' distinctive voice, making every character stand out. Reina is the artistic creator of the Ivanovich series featuring Pavel Ivanovich. Flanking Ivanovich's side in "Deadly Decisions" is Teresa Mancini, who vies with Ivanovich for readers' attention. According to J.M. LeDuc, who was "raised in an Italian family", Teresa "is perfect...like all your characters". Reina is also the author of young adult novella "Cruel Whispers" and its sequel novel "Cruel Past". Reina is an executive editor for Suspense Magazine. She has been interviewed in the newspaper and on the radio with relation to her fiction work. She has been a co-host on Suspense Radio. She has won three Best Speaker awards as well as Best Evaluator at the Voice Ambassadors chapter of Toastmasters. Reina is a member of Sisters in Crime, Los Angeles Chapter and nationally. She has always been active in events. As co-chair and main coordinator for the West Coast Author Premiere, she arranged the weekend-long event to help authors from all over network, learn and share their work with the public. Reina has also been instrumental in compiling authors and planning a local author event at Barnes and Noble in Ventura, California along with the store’s event manager. ’s life is still filled with problems. The two bright things in his world: Teresa Mancini, his fiancée, who, on a good day, has the ability to bring him to his knees and his daughter Rita Grace, a result of a whirlwind affair before he fell in love with Teresa. Once again, murder is the prime evil propelling Pavel into his latest case. After the murder of his partner and friend Nick Haxton’s ex-wife Brenda, Pavel leads a team to dethrone Guillermo Diaz, the leader of a drug gang believed to be responsible for Brenda’s death. Detective Danni Stone joins the local agency. Stone knows Diaz on the most intimate of levels, and wants to be present at his demise. During the investigations, not only does the team grieve with Nick over Brenda’s death, they also deal with the loss of their long-time Assistant Director in Charge Steven Lazlo, who was gunned down in their own backyard. Pavel has a particularly hard time dealing with Lazlo’s death and is determined to hold everyone involved responsible. As if Pavel can take anymore, Teresa receives a substantially large check from an anonymous benefactor, and insists that Pavel deal with it while she decides how to spend it. But not before she uses her iron-willed determination to find out who the benefactor is even if it means breaking into her attorney’s office looking for answers. Being thrown in jail would stop any ordinary woman, but apparently not Teresa. Join Pavel as he wades through harrowing situations, suspects aplenty and suspense in this third thrilling installment of the Ivanovich Series. What do you think of One Major Mistake?? When a team pulls the goalie for an extra attacker, desperately seeking a goal. 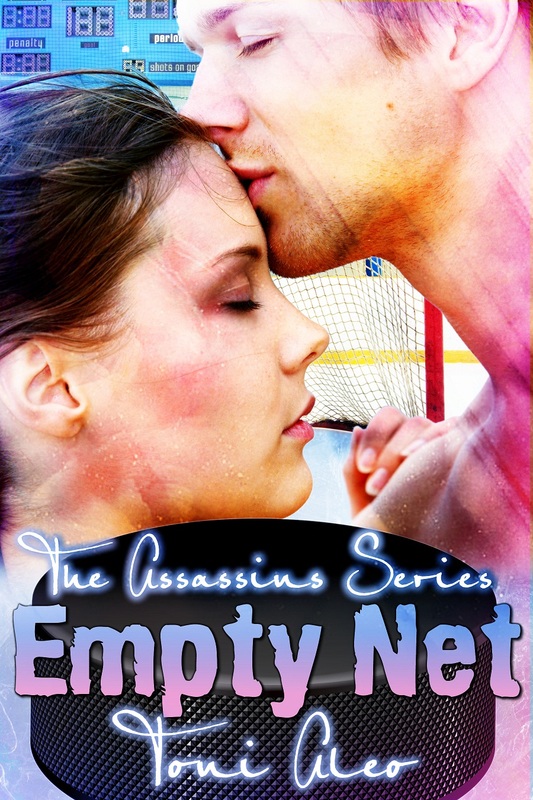 What do you think of the cover of Empty Net? Think the book sounds good? V.V. Aku has always believed in beautiful stories. She found the man of her dreams and her way in complex China, and wrote a fairytale of her own: The Fire of Dawn－a scintillating tale about strength, self-discovery, and a girl who dared to follow her heart. Born and raised in The Netherlands, V.V. Aku (Veerle Ackerstaff) soon discovered that the world was a place worth exploring. After graduating high school, she set out to travel the globe until she finally touched down in China. On the border of Tibet she met Anzi Aku, a wild Black-Yi man who lives at the foot of the Himalayas. She has joined his clan and tries to find her place among the tribe and its shamans. When she’s not researching the clan’s mythology on vampires, she shamelessly gives in to the compulsion to write about the countless characters that haunt her dreams. V.V. Aku is the author of　The Fire of Dawn　and　Black Dusk. She has been the creator of stories since the age of three, and has a Post-Graduate Diploma in English Language Teaching to Adults from The University of Cambridge ESOL. After nearly a decade of working as an English language teacher and TEFL trainer in China, Thailand, The Netherlands, and the UK, she now devotes all her time to writing, her family, and practicing Kung Fu. The Fire of Dawn is her debut novel. It’s the last day of the summer holiday in The Hague when Leah Koopmans’s carefree life as a teen is brutally flipped upside down. Her pale skin turns a dazzling gold, her senses heighten, and her muscles possess an uncanny strength. But with these exhilarating new powers comes a thirst that can only be quenched by one thing: human blood. While her body craves for fresh victims and her heart drowns in guilt, she meets inhumanly handsome Max Machiavelli, who claims that Leah is immortal like him. Infatuation ignites into blistering passion when she joins his coven in Amsterdam. But as the mysteries shrouding her sudden change to immortality unravel, Leah quickly learns that her aversion to taking life isn’t the only thing that sets her apart from this group of herculean strangers. From the picturesque canals of Amsterdam to Corsica’s limestone cliffs and the untamed Siberian wilderness; from first loves to fierce battles, The Fire of Dawn is an extraordinary tale packed with romance, betrayal, and bloodsucking suspense that will keep you on the edge of your seat till the very last page. What do you think of The Fire of Dawn?